Farmland values have faced downward pressure in light of declining net farm income. This week’s post takes a look at the latest 2017 data and considers state-level trends in farmland values. Earlier this month the USDA released their estimates of farmland values in 2017. A quick glance through the report shows cropland values in Nebraska fell hardest, down 6.2% from 2016. Iowa, on the other hand, posted a small increase, up 1.3%. Given these differences for neighboring states, this week’s posts takes a look at farmland value trends over the last few years. Most of the reporting on 2017 farmland values focused on the USDA’s estimate of average cropland values. The national average value of cropland in 2017 was $4,090 per acre, unchanged from 2016 (figure 1). Nationally, cropland values peaked at $4,130 per acre in 2015. Overall, U.S. cropland values have declined less than 1% since the 2015 peak. Figure 1. 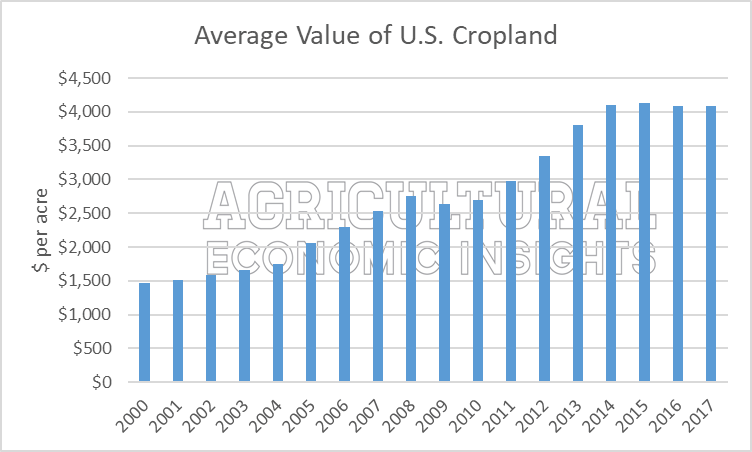 Average U.S. Cropland Value, 2000-2017. Data Source: USDA NASS. In Figure 2, changes in state-level cropland values from 2014 to 2017 are shown. Like the center of a bulls-eye, farmland values in the middle of the country have faced the most significant pressure. In Kansas and Nebraska, farmland values in 2017 were 12.8% and 12.2% below 2014 values. Another observation from figure 2 is how many states actually reported higher farmland values since 2014. Of the 41 states with reported values, only 12 reported farmland value declines. These declines were mostly in the Northern Great Plains and Corn Belt. In some cases, changes in farmland values for neighboring states can vary greatly. Farmland in Kansas was down 12.6%, but up 16% in Oklahoma. In the Corn Belt, farmland values were lower in Illinois and Indiana, but higher in Kentucky and Wisconsin. While a lot of attention, including our own work, has focused on the overall difficult agricultural economy, there are states and regions of the country where farmland values have trended upward. This is especially true in the South and West. Figure 2. Change in State Cropland Values, 2017 vs 2014. Data Source: USDA NASS. When preparing figure 2, a lot of consideration went into which years to compare. Should 2017 farmland values be compared to 2014 – the year net farm income began to decline – or 2015 – the year U.S. average farmland values turned lower? At the state-level, farmland values peaked in 2014 for some, but continued higher for others. In figure 3, this challenge is illustrated by showing the annual change in farmland values for select states in 2015, 2016, and 2017. The states in figure 3 are mostly in the Midwest, but no specific criteria were used for selection. Farmland values in Iowa were sharply lower in 2015, with a modest decline in 2016 and an uptick in 2017. North Dakota and South Dakota, on the other hand, posted sharp increases in 2015 followed by declines in 2016 and 2017. Farmland values in three of the selected states increased in each of the years considered; Kentucky, Tennessee, and Wisconsin. This was especially true in Wisconsin, which maintained farmland value increases of more than 4% in each of the years. Figure 3. 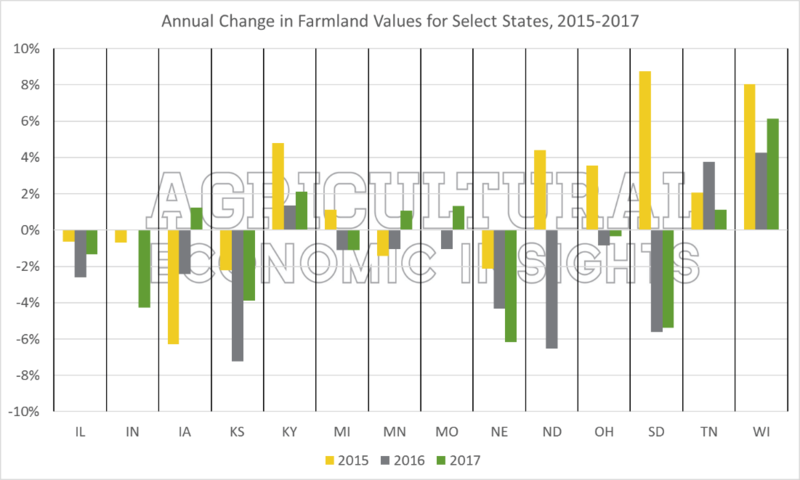 Annual Change in Farmland Values for States in the Midwest, 2015-2017. Data Source: USDA NASS. Focusing on the Midwest states with declining farmland values, figure 4 shows the magnitude of declines for 10 states. 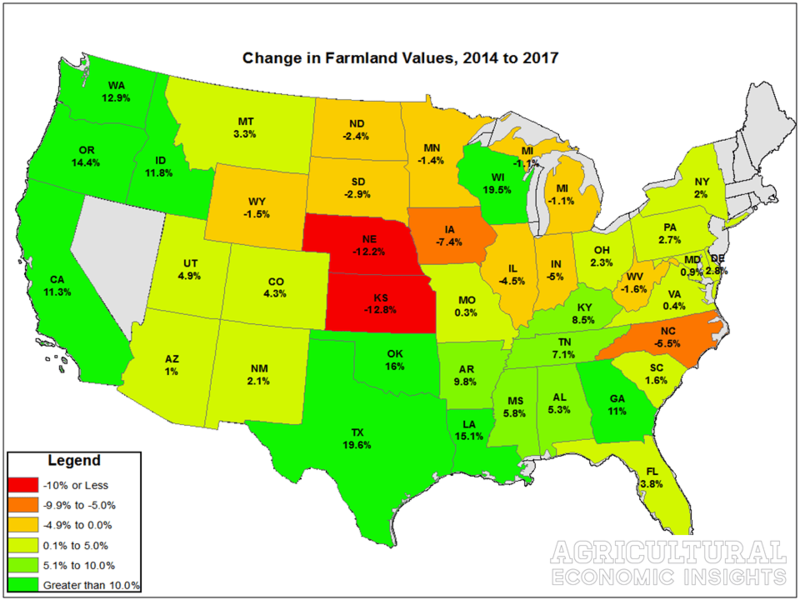 More specifically, the maps shows the percentage change in farmland values from the highs to 2017. 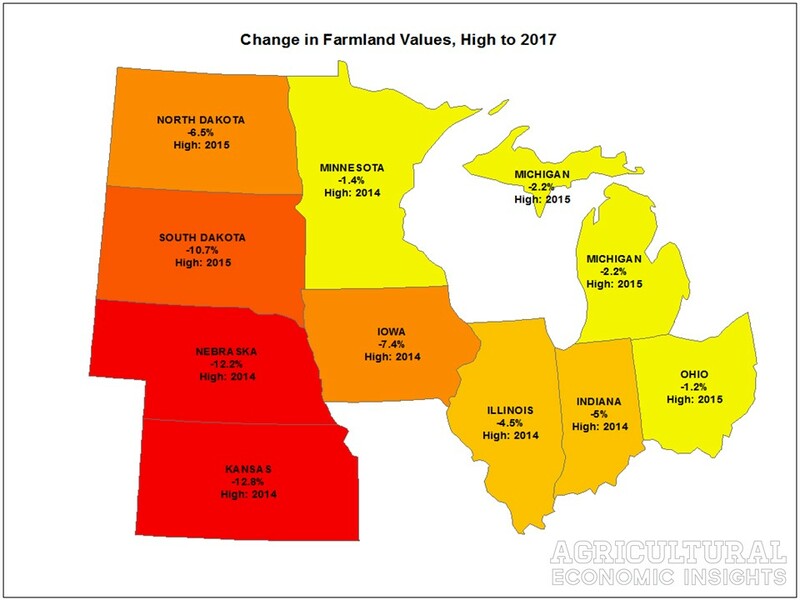 The high year for farmland values is noted for each state; this was either 2014 or 2015. Again, Kansas and Nebraska have experienced the largest declines. South Dakota, where farmland values peaked in 2015, has posted a 10.7% decline in just two years. The largest declines have occurred in North Dakota, South Dakota, Nebraska, Kansas and Iowa. Not surprisingly, these five states were identified in our earlier post for having the largest gains in values from 2004 to 2014. Figure 4. Declines in Farmland Values for Select States, 2017 vs 2014. Data Source: USDA NASS. Just as changes in farmland values and net farm income varied by state during the boom-era, changes in farmland values in recent years has also varied. Across the Midwest, farmland in the Northern Great Plains and Iowa have contracted the most. The trend of declining farmland values has been some what isolated. Only 12 states, mostly in the Midwest, have posted lower values since 2014. Elsewhere in the U.S., farmland values have trended higher. In an earlier post, Brent pointed out there are multiple surveys and estimates of changes in farmland values. That post, and a summary of some of those measures, can be found here.